New research indicates that introduced ‘alien’ honey bees are competing for resources with native bees and threatening the survival of plants that rely on interactions with specific pollinators. The study, published in the journal Diversity and Distributions, was led by Dr. Olivia Norfolk of Anglia Ruskin University, who carried out the work alongside academics from the University of Nottingham. 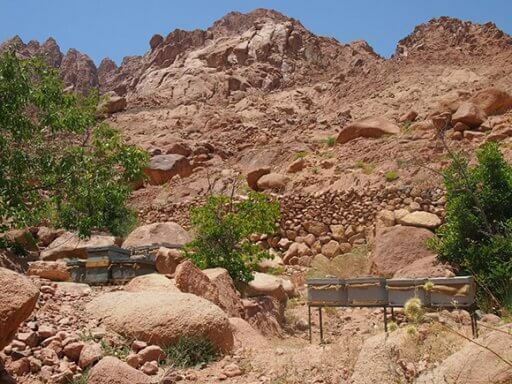 The scientists monitored the interactions between plants and their pollinators in the mountainous region of St. Katherine Protectorate in South Sinai, Egypt. The region supports many range-restricted endemic plants and pollinators whose future may be jeopardized by the recent introduction of non-native honey bees. The mountains are characterized by the presence of Bedouin orchard gardens, which act as hotspots for biodiversity, providing valuable habitat for wild plants, pollinators and migratory birds. These gardens form the basis of traditional Bedouin livelihoods, but recently honey bee hives have been introduced to supplement their income. The study found that introduced honey bees were extremely generalized in their foraging behavior, visiting 55% of available plant species. However, they made few visits to range-restricted plants and showed high levels of resource-overlap with range-restricted bees. In this arid resource-limited environment, the presence of high numbers of super-generalist honey bees may pose a competitive threat to native bees, particularly in periods of drought. A previous study in California showed that high numbers of feral honey bees reduced bumble bee populations through intensified competition over floral resources. The research also found that the range-restricted plants were significantly more specialized than wider-ranged counterparts. These plants showed a much higher dependence on range-restricted pollinators and received very few visits from the introduced honey bee. The effects of floral competition, where honey bees out-compete more efficient native pollinators, could lead to a drop in native bee visitation and a subsequent decrease in their reproductive success. Dr. Norfolk, Lecturer in Animal and Environmental Biology at Anglia Ruskin University, said: “In this mountain system, range-restricted plants exhibited much higher levels of specialization than their pollinators, suggesting that they may be more vulnerable to extinction. “Range-restricted pollinators exhibited high resource overlap with the super-abundant honey bee, which could lead to resource competition. Even a small reduction in the population size of range-restricted bees could be detrimental for the reproductive success of range-restricted plants, which depend on low numbers of specialized interactions. “The introduction of honey bee hives is a common strategy encouraged by charities and NGOs to supplement livelihoods in rural regions. Our research suggests that hives should be introduced with caution because super-generalist honey bees compete with native pollinators and can cause pollination risks for range-restricted plants.